Vintage back issues of Record Song Book magazine are in stock with negotiable prices for multiple purchases. 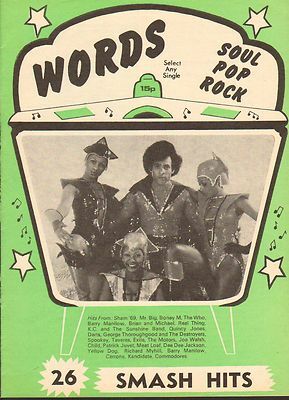 Words or record song book was a teen pop music magazine from the 60s and 70s featuring song lyrics of chart hits and misses, with some news/features and photos it was not much more than collections of song lyrics for teenagers. Aside from the front covers all content was B&W. 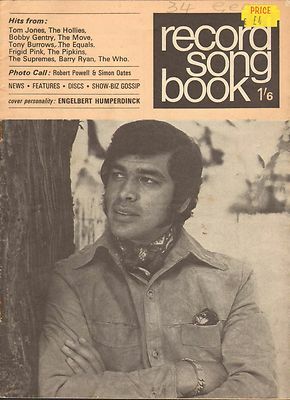 Record Song Book Magazine 1-1-1968 Gene Pitney on Cover John Baldry on rear. Record Song Book Magazine 1-1-1969 Scaffold on Cover Val Doonican on rear. Record Song Book Magazine 1-10-1967 Alan Price on Cover Traffic on rear. 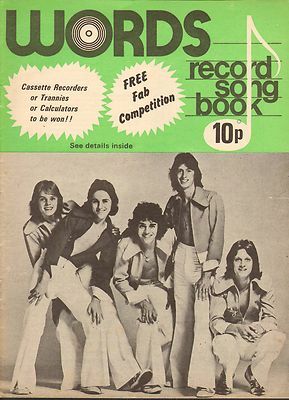 Record Song Book Magazine 1-10-1968 Bee Gees on Cover Anita Harris on rear. Record Song Book Magazine 1-11-1967 Scott Walker on Cover Diana Rigg on rear. Record Song Book Magazine 1-11-1968 Clint Eastwood on Cover Cliff Richa on rear. Record Song Book Magazine 1-12-1967 Bee Gees on Cover Tony Blackburn on rear. Record Song Book Magazine 1-12-1968 Barry Ryan on Cover Traffic on rear.